I'm writing a book on smartphone support for teens and adults on autism spectrum and cognitive disabilities. I all this group Explorers. The more I look at (remote) Screen Time the more impressed I am by the power and complexity of this project. Today, for example, I realized there is an option to include or exclude “Website Data”. I also discovered that after you’ve set an app limit time, a magic “Customize Days” option appears! I can’t “unsee” “Customize Days” now, but for weeks I didn’t notice that it suddenly appears once you set a time value. It’s not perfect by any means. Screen Time reports don’t always update promptly. I have a device that refuses to enroll in Screen Time. The need to change an Explorers Apple ID age to be under 18 is more than frustrating — this should be an Accessibility setting. We need Apple to offer an API that devs can build solutions around, so the burden of making this work doesn’t fall only on parents. Note least — we need better documentation! That’s the current set. Next step is to finish my own take, then go through each of the above and add in what I’ve missed. 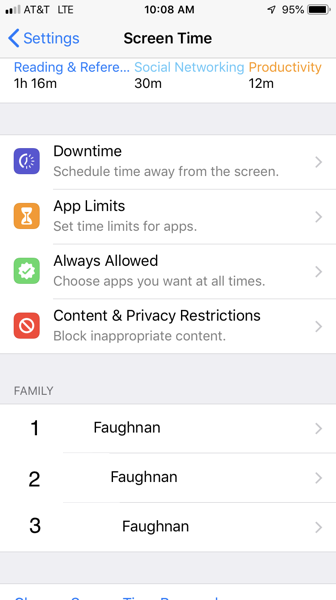 With iOS 12 Apple made big changes to what it used to call “restrictions” or “parental controls” and is now called “Screen Time”. It took me a while to appreciate the power of Apple’s approach. It’s not everything Explorer need, but it’s a big step forward. I’m seeing encouraging tweaks and improvements with minor revisions to iOS 12; I think Apple has decided to get this right. The really big change is that, with the right setup and configuration, it’s possible for a Guide to use an iOS 12 iPhone or iPad to remotely manage app use on an Explorer’s iOS 12 iPhone. I call this Remote Screen Time. I’ll review what it can do here, in the next chapter I’ll discuss local Screen Time and how to make Remote Screen Time work. Using Screen Time a Guide can define a core set of apps that are always available and then set time limits on individual apps or categories of apps. For example, a Explorer’s iPhone could be set allow only productivity apps during work hours but enable full use after work is done. How important is this? It can make the difference between employment and unemployment. This is a big improvement over what we’ve had for the past 8 years. There is still room for improvement though. Apple, at the time I write this, has wounded (broken, really) its web access content controls. 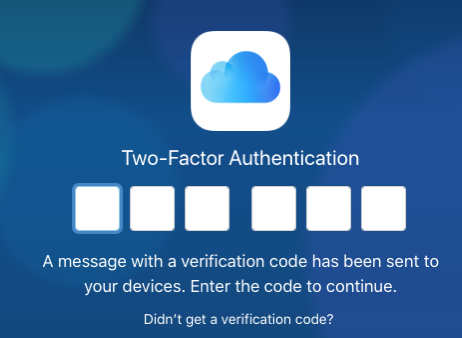 It would be nice to be able to manage devices from iCloud as well as a Guide’s iPhone. You can’t mix local (on device) and remote Screen Time. There are many small bugs. There can be odd delays in Screen Time enrollment and updating. Most of all there’s an age problem — in order for restrictions to work optimally an Explorer’s age needs to be set in their Apple ID to be under 18 (more on that later) and they have to be configured as part of a Guide’s “family”. That’s the bad news. I’ll go over the setup and workarounds in the next chapter, but here I’ll review what we do and why it’s worth the struggle. The Screen TIme image below is taken from my (Guide) personal iPhone. I got to it through Settings:Screen Time. 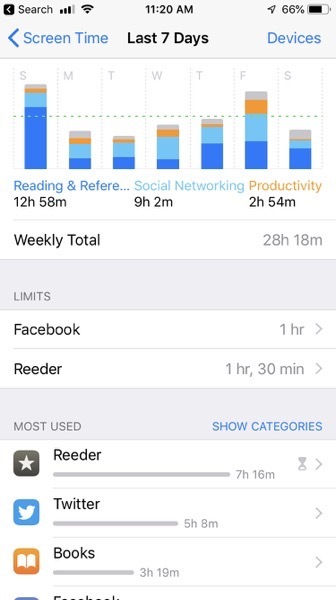 The image shows my personal Screen Time settings first, then in a section labeled “FAMILY” it shows 3 members of our family (names hidden) who are, as far as Apple knows, “under 18”. I can tap on those names to see a screen that is identical to my personal, locally managed, screen. For each FAMILY member you can see reports like this for a day or a week or a day, for one device or for multiple devices (such as an iPad and an iPhone). The key features of Screen Time are briefly described in the iPhone User Guide. Please take a look at those, but there’s quite a bit that’s left out. Screen Time has 4 parts: Downtime, App Limits, Always Allowed, and Content & Privacy Restrictions. I’ll talk about the Content & Privacy Restrictions in a later chapter, along with some other iOS settings that are important for safe iPhone use. Downtime, App Limits, Always Allowed are the main ways to setup Screen Time. There’s another hidden and undocumented control that extends App Limits, I’ll discuss it together with App Limits. Assuming remote Screen Time is working (see next section on setup), the first thing to do is define the apps that are Always Allowed. These will be available regardless of time related blocks. For most Explorers this will be the safety and productivity apps like Health, Contacts, Notes, Calendar, Find Friends, Maps and so on. Other standard items I enable include Calculator, Camera, Compass, Files, Find Friends, Mail, Music, Photos, Weather, and Voice Memos. I also enable Messages though it can be a distraction for some Explorers. 1. Schedule a time interval during which all non-Allowed apps will be blocked. A family user can request more time from a family manager. There’s just one time interval, you can’t schedule different intervals on weekday vs. weekend for example. This is most useful during an Explorer’s work or school hours. 2. Schedule a time interval when the entire device will be blocked. We don’t use this. 3. Set a daily Time Limit for collections of apps like “Social Networking”, Games, and so on. This is total time, not a time interval. These collections are based on how apps are classified in Apple’s App Store. Sometimes they are a bit odd; on one Explorer’s iPhone “Police Scanner Radio” is classified as “Reading & Reference”. We have made use of limits for “Social Networking” and Games, but I actually find the next, undocumented, method more useful. 4. Set a daily limit for a specific app. This undocumented feature is only available for apps that have already been used by an Explorer. It doesn’t show up under “App Limits” where you’d expect to see it! To set a daily limit for a specific app you have to first tap on the summary of screen time use. This shows a screen where you can see use for “Today” or for “Last 7 Days” and, for Explorers with both an iPad and iPhone you can choose which device to see. Here’s where the secret is found. It may not be obvious, but you can scroll down to see a list of either most used Apps & Websites or Categories for either the current day or the past 7 days. This the real power in Screen Time. You can set daily usage limits for a specific app or even a specific web site. This is where we do most of our adjustments. There’s a lot of power hidden in remote Screen Time once you have it working. Some of it is more obscure than it should be, but it’s great stuff. To summarize first step is to specify which apps are always allowed, then block all non-Allowed apps during work or school hours, then, if desired, set usage limits on individual apps like Instagram, Snapchat, Safari and the like. I think the almost forgotten iPod Touch would also work. Even an old iPhone 5s can do remote control as long as it’s running iOS 12. We are all, fundamentally, Explorers. Advanced Explorers, including Guides, may find it helpful to set personal, locally managed, Screen Time limits. Assuming we known our own Screen Time passcodes we can override them, but I find it helpful to set a limit on my compulsive reading habits. “Content & Privacy Restrictions” aren’t related to time at all, so it’s awkward to have them bundled under “Screen Time”. A more accurate, but less engaging, name for all these things would be “Restrictions”. See discussion of Health.app. 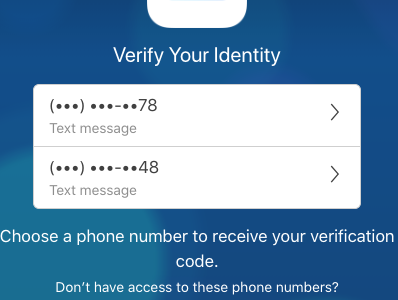 This provides critical health information even when an iPhone is locked. You need this to work. I hope this gets fixed in iOS 13. It really should show up under App Limits.